If you have good organizational skills and a facility for numbers, a career in the accounting field could be the key to advancing your career. 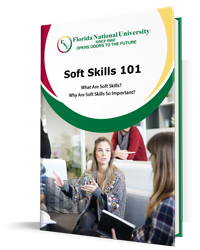 At Florida National University, we offer a Bachelors Degree in Accounting that paves the way to a promising career with great salary and advancement potential. Getting a solid foundation of knowledge through the acquisition of a Bachelors Degree will make you eligible for a host of well-paying jobs. Whether you are looking to jumpstart an accounting career in the public or private sector, the Bachelors Degree in Accounting is a key step towards promising job options. Completing a Bachelors Degree in Accounting will make you a strong candidate for accounting jobs in small-and medium-sized enterprises, as well as large corporations, nonprofit organizations and trusts, and government agencies that require professionals to manage their financial accounts. In addition, if you are aiming for a higher position as a senior-level accounts manager, a Bachelor’s Degree in Accounting provides expanded educational and career possibilities. The cornerstones of accounting gained in the course of the Bachelors program furnish you a strong background when you are ready to transfer and pursue your Masters, which could translate into high earning potential. Earning an Accounting Degree provides students with all the basic knowledge that enables them to prepare financial records and statements for a company, government entity, or organization. The accountant’s most significant duties include the maintenance of cash flow statements, reconciling of bank statements, keeping profit and loss accounts, and recording balance sheets. These are complex procedures that require a detail-oriented eye and strong organizational skills. A bachelor’s degree in accounting thus furnishes students with a comprehensive grasp of accounting procedures, principles and conventions, as well as the latest government rules and regulations that are necessary to professionally and competently handle such accounts. While the Bachelors Degree in Accounting gives a general overview of accounting processes and procedures, various electives allow students to gain specialization in various areas, depending upon the student’s interest and aptitude in a particular area. There are many different opportunities for pursuing a job or a professional practice later on. The accounting degree at Florida National University (FNU) provides students with a solid academic foundation that paves the way for professional careers in accounting-related areas of business and government. Our program also prepares students to pursue advanced education in accounting and accounting-related fields. It is necessary to keep in mind that the Bachelor in Accounting degree does not in and of itself satisfy the eligibility requirements to sit for the Uniform Certified Public Accounting Exam or to practice as a CPA in the State of Florida. Accounting is a highly technical and knowledge-oriented field. When mistakes are made in accounting, it can prove very costly for the business. For this reason, employers take professional training and education seriously – having the right degree is thus fundamentally important in order to establish a career in the accounting field. With this degree, a whole world of accounting jobs is opened. 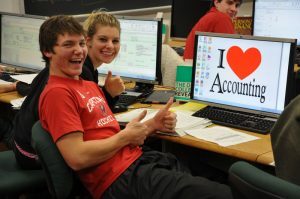 Earning a Bachelors Degree serves as the ideal launching pad for a promising career in accounting. Those who want to immediately enter the accounting work force after earning their Bachelors in Accounting should have little trouble finding a position in this high-demand field. Another option is to pursue a higher degree in accounting through online courses or part-time or distance education. Higher qualifications will ensure that you gain a professional expertise or particular specialization in the field of accounting, which can provide expanded career opportunities in the future. In today’s challenging economic times, as many businesses, organizations, and governments are struggling to remain profitable by cutting costs and reducing jobs, many students have found that a Bachelors in Accounting degree offers promising job options as well as job security and stability. Indeed, in times of economic downturns, the jobs that get affected the most are usually related to sales, marketing, research, and other areas where the companies can afford to downsize their operations due to weaker business demand. However, accounting is fundamentally different. Accounting is a unique field whose relevance and importance only increases further in a recessionary condition. Why? Being able to control costs and ensuremanaging finances effectively is the key to survival in tough times. A trained accountant can potentially save big money for small and large companies alike. How? By knowing exactly how to handle the account statements in the most efficient manner possible, how to reduce tax liabilities, how to cut operational costs without letting business efficiency slacken, and most importantly, how to forecast the future financial conditions and trends for the company. The demand for good accountants with a strong education remains high despite a slow economy. What are you waiting for? The FNU Bachelors in Accounting could be your ticket to a well-paid, stable career path. Contact an academic advisor today for more information!